Maya is the sweet old black Labrador belonging to Jaime. Jaime is a Registered Veterinary Technician who worked with us at South Windsor Animal Hospital for many years before going back to the University of Guelph for animal nutrition. Maya began limping a bit and causing “off” gait (in other words, she walked a little funny) She came in for a physical examination and x-rays. Through these two important tests, she was diagnosed with a partially torn cruciate ligament (I am sure many of you have heard of athletes tearing their ACL (anterior cruciate ligaments) in their knee). This ligament is responsible for stabilizing and holding the femur (thigh bone) to the tibia (shin bone). Over time this ligament has fibers which can slowly break, like a fraying rope. It is most prone to breakage in an obese dog, an active large breed dog but can rupture in any animal. 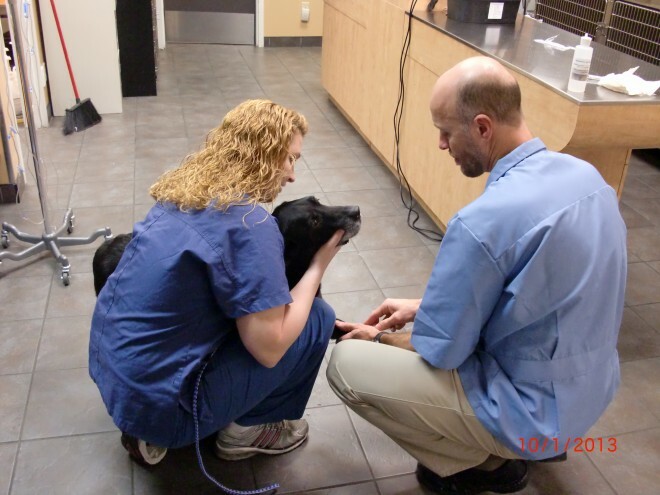 Surgery was the best option for Maya and was scheduled for a couple weeks later. 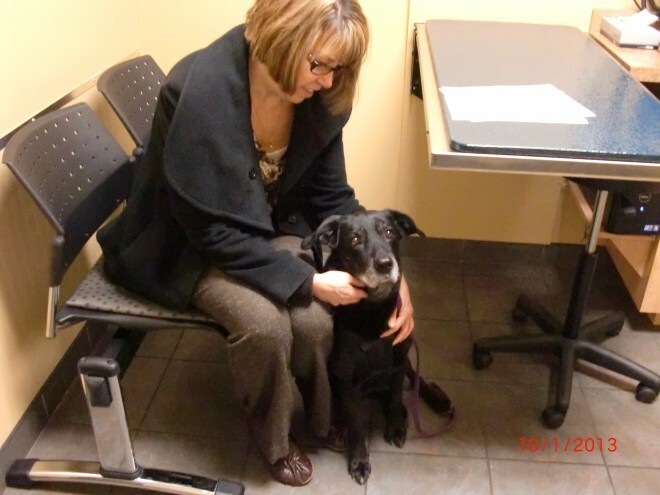 Maya arrived early in the morning for her pre-operative examination and blood work with her “grandma”. She was such a wonderful patient. 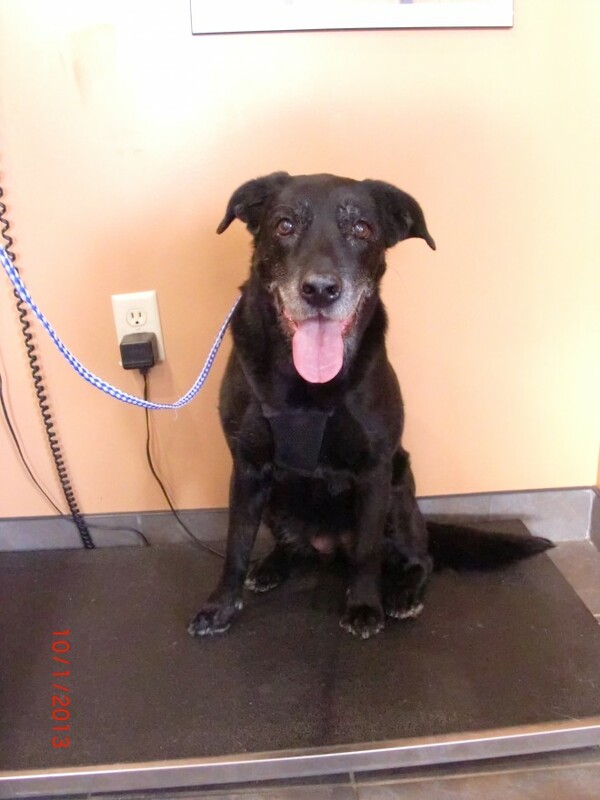 We know that her family was worried as Maya can be quite nervous and gets anxious at the clinic, but she was very happy to hang out with the staff at South Windsor Animal Hospital. Her blood work was normal and aside from her knee, her pre-surgical physical examination revealed no abnormal findings. Maya was given her sedative, a pain patch was applied to the side of her body and IV fluids were started. To reduce her anesthetic time, Maya’s surgical leg was prepped (shaved) and cleaned while she was snuggling with us. Her surgery went on without a complication and she recovered very well. Within a short time, she was standing at the door and excited to go outside. Maya returned home the day after surgery and has been recovering well at home and she is expected to make a full recovery. After a six week period of exercise restriction, we have slowly been introducing Maya to increasing increments of activity. We thought we would share a few photos of Maya throughout her stay with us at South Windsor Animal Hospital.